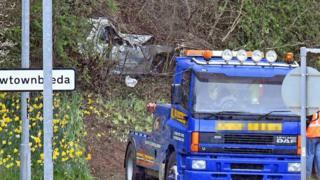 Police believe the death of a teenage girl, found near Belfast City Hospital, is connected to a single-vehicle crash on the outskirts of the city on Sunday. The 17-year-old was found next to a grey MG car in the hospital grounds on Lisburn Road shortly before 03:00 GMT. Police said a post-mortem examination would be carried out. Police and forensic officers were at the hospital on Sunday and the MG car was covered in a forensic tent and later taken away. Ch Insp Michael Gregg said the police inquiry was "at an early stage" and appealed for information. "We need to know how this young girl was brought to the hospital, by whom and from where," he added. The Mercedes car was found on Castlereagh's Ballygowan Road, near its junction with Manse Road. At the scene of the car crash, which is being linked to the discovery of a teenage girl's body at the City Hospital, there is a broken concrete post. It appears that when the vehicle left the road, it hit the post before coming to a stop. There is also a fallen tree. Vehicle parts are lying on the ground, including a wing mirror. The scene of the crash is at a roundabout where the Ballygowan Road meets Manse Road in the Castlereagh hills. It is eight miles (13km) from the City Hospital in Belfast, a journey of about 20 minutes. As part of his appeal, Mr Gregg said police want to speak to anyone who saw the Mercedes car in that area between 01:00 and 02:30 GMT. He asked: "Did you witness the collision? Did you see any other vehicles in the time after the collision, including a grey MG? "It's important we can track the movement of the vehicle involved to help us establish what happened." He also appealed for anyone who saw the MG car at Belfast City Hospital to contact detectives. "If you have information about the collision or the circumstances surrounding the death of this young girl which you believe could assist our investigation, please pick up the phone and call us."